Myriam Reid is a graduate of the Faculty of Music of the Université de Montréal. After studying piano, guitar and singing, her love of music led her to the harp. This mythical instrument with incomparable sound quickly became her passion. For several years, Myriam Reid has been performing regularly at various events, both in the Greater Montreal area and elsewhere in Quebec. 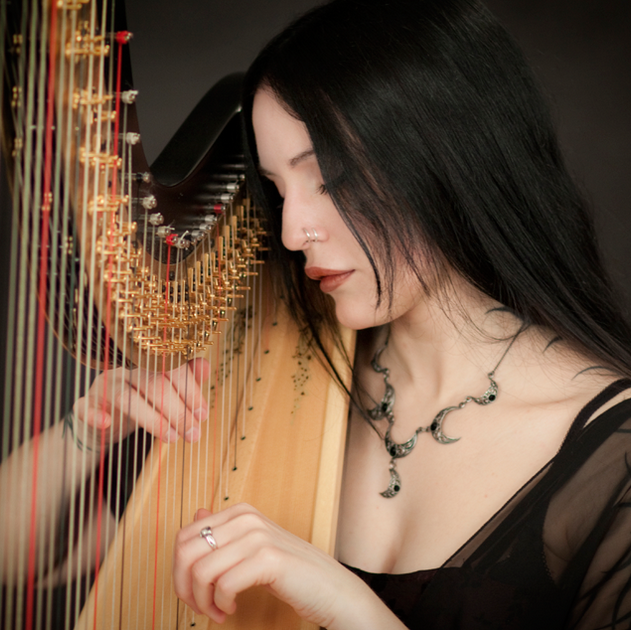 Her repertoire, an mix of classical, popular, medieval and celtic music, also includes many compositions of her own. Their richness and originality have earned her an international prize at the New Century Harp Competition writing and arrangement contest. Her five albums, Brumes (2007), Feux Follets (2010), Neige Folle (2011), La Nuit des Temps (2015), and L’Automne (2018) got a lot of elogious reviews, both in terms of the quality of melodies and the finesse of the interpretation. The versatile harpist has participated in projects of all kinds: studio recording with pop/rock bands (Philosonic, High Dials, Tuias, RaevenScry) as well as classical performers (Nadine Guertin, Geneviève Sainte-Marie, sopranos), recording of film music (Love and Savagery, nominated in the category “Best Music” at the 2010 Prix Jutras and Prix Génies) and numerous performances with artists from the cultural scene. Following a grant from Canada Council for the Arts, she was also welcomed into an artist residency at the Banff Center for the Arts and Creativity.